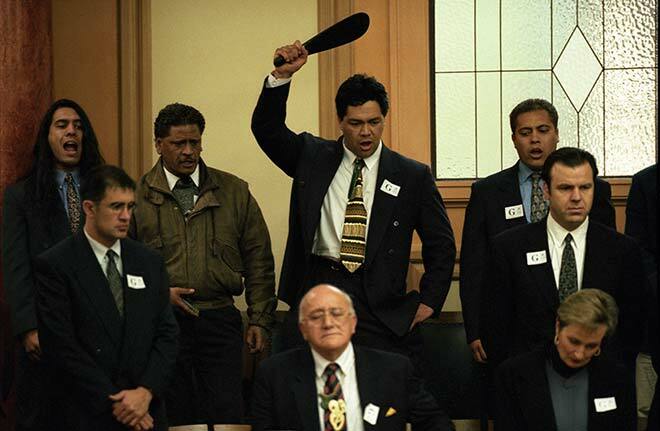 Rakiihia Tau (centre back) raises his mere during a haka by members of the Ngāi Tahu treaty claim negotiating team at Parliament in 1997. In front of him sits chief negotiator Tipene O'Regan. These negotiations followed a 1991 Waitangi Tribunal report that recommended substantial compensation for the loss of almost all of Ngāi Tahu's tribal lands. In 1997 the tribe accepted a settlement valued at $170 million.